With the recent Danger Zone update, we've updated the demo analyzer to support the new demo formats, and they now show the ranks of everyone in the match. You can even use this instead of adding the Steam bot if you want to show your rank on your profile! To learn about the demo analyzer head over to the matches page. We've also redesigned the list of matches on everyone's profile. You can reach this by going to your profile, and clicking "matches". As always, you can email us at support@gamurs.com with the subject line containing "CS:GO Stats"
Today we've launched a very basic implementation of an automatic match history! Valve doesn't give this data out, so we have to do some magic to capture it. To use the feature, just visit your profile after a competitive match, and we'll store your match. Soon we'll add an averages calculator to make weekly analysis more convenient! A couple new things to announce: Firstly, we've released a bunch of new guides to help you learn more about CS:GO, ranging from ranking up to learning to spray! Depending on the feedback we get, we could start making map guides, or weekly skin selections, etc. Secondly, we've got a new partnership with LootBear.com who allow you to both buy and rent skins! A lot of time you can find a nice deal on certain skins, or if you'd rather rent, you can rent expensive knives for just a few dollars! So be sure to check out our skins gallery for exciting deals! We're happy to announce something special today, we've added guides pages for every weapon! On each page will be the weapon stats, as well as a constantly updated list of all the skins and their prices. Just head to the new nav-bar item at the top! 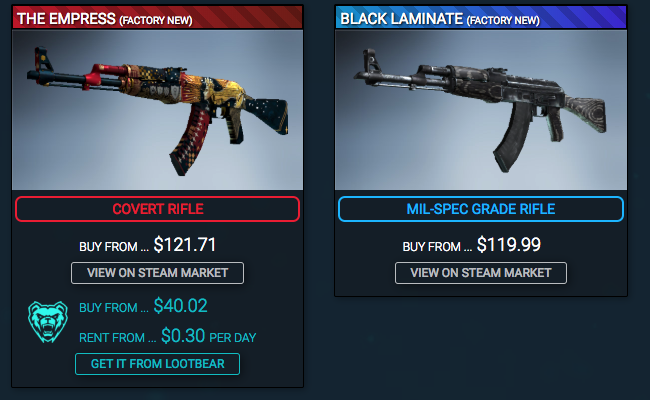 You can check out the AK-47's page here. At the bottom of the page you'll see all the skins, and you can click on them for more details and a link to their market page! We're working on adding more StatTrack pricing support, as well as more in-depth guides coming soon! We've added back in the stats page (https://csgostats.com/stats) so you can see how many wins on average it could take to reach each rank. This data comes from the community who are adding the bot! So big thanks to you guys. After a lot of email feedback we're going to give the leaderboard section some much-needed love. Starting today, the leaderboard will only show the players in the last 30 days who have added the bot and gotten their wins counted. Eventually, it will count your k/d ratio, win %, headshot %, etc to get a better rating and will showcase the highest skilled players in the community (instead of just wins currently)! We're releasing a new feature today! You can now sign up for weekly performance reports, which will track the stat changes over the coming weeks. We've also added in a simple algorithm to analyse your performance and give some feedback. More info and screenshots at the reports page. CS:GO Stats has now officially been merged with CSGOSquad, and we've also fixed the bot issue with updating your rank. We've set up a new Steam account you can add (https://steamcommunity.com/id/csgostatsrankfinder) to get your rank scanned! The old bot has been turned off. We've fixed some issues mentioned in the community feedback as well as moved to the next step in the merge. There's still an issue with the bot that updates the ranks, we are working to get it fixed! The launch of Bullseye 10 days ago was a blast! In today's update, numerous bugs have been fixed. Renamed "Team 1" to "Team A" and "Team 2" to "Team B"
Added online demo analyzer (code named Bullseye)This is a feature we have been working on for a while now. Simply enter your demo sharecode in the search bar, and we will analyze the demo for you! The Bullseye is still heavily under development, so any feedback is very appreciated! As soon as a match is submitted, it will be also be added to every player's profile page. This means that if someone else submits a demo with you in it, you will be able to see it on your profile page as well! Opening Duels - Who is the best entry fragger? Who is the best site holder? and much more! Performance - Average damages per round, average kills per round, average deaths per round...We've covered them all! Nades - Statistics of HE grenades, flashbangs, decoys, smokes, molotovs and incendiary! Want more? We are constantly adding new features. Drop us an email if you have any feedback! Player Profile pages have been completely redesigned. There are a lot of new exciting features! We are testing steam logins on the site. They do not serve any purpose yet..but expect many exciting things soon! Redesigned the navigation bar with dropdowns. Another update! The majority of the changes in this update are behind the scenes. This update will prepare us for a huge upcoming update! we have finally unlocked the 'update your stats' button. Now you can add your competitive ranks in our database by simply adding our bot on steam. Keep in mind that manually added ranks will not be counted in the ranks distribution graph. Go to your profile page and update your stats now! It has been a crazy week. In this small update, we redesigned the ranks distribution page as well as altered some colors in the stylesheet. You are now able to view rank distributions in chosen time periods. We hope this update can provide everyone a better idea of the recent rank shift. Hello everyone! We want to announce the release of player statistics page today! The profile page shows a lot about each player, including his weapon usages and maps he played. His competitive CS:GO rank also be shown, if available. We will soon let players be able to add their competitive stats to our database. However, manually added ranks will be not included in the CS:GO ranks distribution graph. Let us know what you think! Cheers! Hello everyone! Over the past 2 weeks, we have been working hard on a site redesign, and here is the result! Now that is finally done, we can finally start implementing individual player profile pages, and most importantly, player rankings! In addition, we are glad to announce that our database has reached 100k players! Thank you for your support! Hello everyone! We have finally added rank stats in our game searcher! We have only recently begun to fetch player ranks, so our database is still very small, but it will continue to grow at a rapid pace! Thank you for your support! Added Live Rank Distribution Graph page. You are able to view the current rank distributions of the players in our currently database. It is constantly growing! This is only the tip of the iceberg of what's possible. We are going to release player rank look up very soon! Stay tuned! Added Live Matches page. You are able to view the 8 featured competitive matches there. We are currently working a on way to fetch people's ranks, as well as our twitter page and steam group. Stay tuned! Today marks the first day for CSGOSquad. The amount of feedbacks we received were overwhelming! A big thank you for all your support! We are looking forward to continuously push out updates in the future!